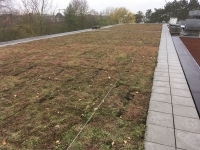 Installation in Gent of the first OASIS blue roof of Belgium. The Pump House Project, Tidal Basin Road, Royal Victoria Docks London. New installation of our pre-vegetated tray Hydropack.